Microsoft Power BI transforms your company's data into rich visuals for you to collect and organize so you can focus on what matters to you. Stay in the know, spot trends as they happen, and push your business further. Power BI is a suite of business analytics tools to analyse data and share insights. Monitor your business and get answers quickly with rich dashboards available on every device. Power BI dashboards provide a 360-degree view for business users with their most important metrics in one place, updated in real time, and available on all of their devices. With one click, users can explore the data behind their dashboard using intuitive tools that make finding answers easy. Dashboards can be created from over 50 plus types of sources like Microsoft Excel, SSAS, Access, Azure, Facebook, etc… and can access the data and reports from anywhere with the Power BI Mobile apps. Using the Power BI gateways, you can connect to your organisations on premise SQL Server databases, Analysis Services models, and many other data sources to your same dashboards in Power BI. 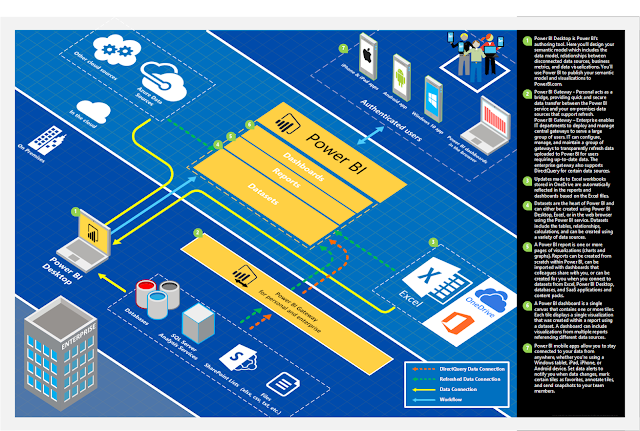 The high level Power BI architecture look like below with the different components connecting with each other to give you the power of data visualisation.